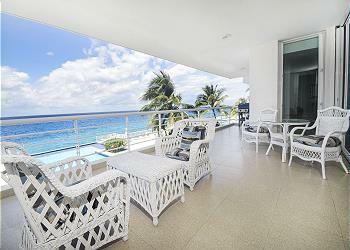 This gorgeous oceanfront property will captivate you as soon as you arrive! Located on the quieter northern end of the island of Cozumel, Nah Ha is a beautiful, modern complex where you can enjoy your dream vacation. Lounge poolside and soak up the tropical sun, or dive right into the crystal clear water and snorkel. Downtown San Miguel is just a 5-minute drive away, where you can shop and explore. The beauty and serenity of this vacation property will keep you coming back for more!